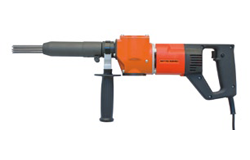 The same excellent performance as our air tool! Operated with standard electric supply to households. Special long and slim barrel design suitable for narrow corners. Double-insulated motor does not need grounding. Free subhandle position best fot to your working situation. 6 mm Hex. Socket Skrew Key: 1 pc.